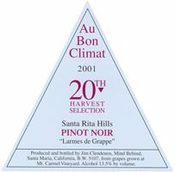 Posted byDave the Wine Merchant	 November 27, 2006 Leave a comment on What price, flavor? This morning, as I was waiting for my Mother In Law’s latest walking tour of Whole Foods, I decided to check out her local wine shop. It was an eclectic mix of $7 wines on the same rack with $150 wines, one of which was a wine from Au Bon Climat I’d never seen (right). As I was reverently examining the bottle, the shopper next to me said in disbelief "Over $100 for a wine?? You must be kidding!! I’ve tried expensive wines before and they’re just not worth it. I drink perfectly good wine everyday and never pay more than $10 a bottle!" Which isn’t something you say too this wine merchant without making me wonder "how much of the population feels that way?" There is no way of knowing, of course, but all the way home I kept thinking "Man, I hope it’s a diminishing percentage…"
Then I came home and basked in the comforting glow of the Associated Press story "For coffee purists, home roasting is the only way to go". What does that have to do with wine? Most importantly, it indicates there are a significant number of people willing to invest time and money in the pursuit of a unique flavor experience. And coffee is a bellwether indicator of the state of the American palate. Since 1990, the rise in gourmet coffee has coincided with other indicators of a sophisticated national palate – the Slow Food movement, the Food Channel, Celebrity Chefs, Farmers Markets, the organic food movement, and the sustainable farming movement. What started the growth in gourmet coffee? There had always been artisanal roasters, primarily concentrated in the Northwest. Then about sixteen years ago, an artisanal coffee company out of Seattle grabbed American coffee drinkers by the tongue and led them to premium coffees as they had only been known by the lucky few in Seattle, Portland and the San Francisco Bay Area. (What is it about fog and drizzle that produces fans of premium coffees?) This company is Starbucks, the company which still defines "gourmet coffee" for much of the nation. Of course, some 12 years into Starbucks’ existence, they found it necessary to embark on dumbed-down "coffee drinks" – beverages made with a bit of coffee, lots of milk, and more sugar than your average soft drink. This is the classic story of a public company forced to transition from "exclusive niche" to "mass market" to maintain growth. But along the way Starbucks created millions of gourmet coffee drinkers who have graduated to other boutique roasting companies and embarked upon relatively easy and inexpensive home roasting experiments. Much like the growth of online wine sales, the home-roasting coffee movement has occurred largely online. Centered in major metropolitan areas with educated populations interested in new food experiences, the home roasting market is identical to that for premium wines. Coincidence? I think not. Such places are home to the inquisitive palates willing to pop for gourmet flavor experiences. Offers more than 60 varieties of raw coffee beans from premium growing areas. Located in Oakland, CA, Sweet Marias is a legend in the home roasting world, selling 400,000 pounds of raw beans every year. A visit to their website tells the story – everything the home roaster might need, including information and education. A Mass.-based seller of roasted organic, fair trade coffees, they began selling raw beans last year after receiving requests from customers. They now sell over 10,000 pounds a year, mostly online. Out of Auburn Hills, MI. 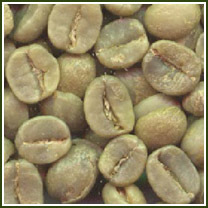 Another provider of raw beans, equipment and books, this website offers a line of raw beans and equipment for sale, but little information or eduction on home roasting. There will always be people who only drink wine priced below $12. And there will always be people who drink Folgers Crystals. But premium wine is like premium coffee – of interest only to those willing to spend hard-earned money to experience unique flavors unappreciated by most. For those interested in learning more about premium wines, our site provides a good starting point, and customers enjoy access to our Wine Advisory services via our toll-free number at 866-746-7293.